Mr. GDC's company is based in Atlanta, Georgia. Often employees are needed in the Houston area for several days at a time. 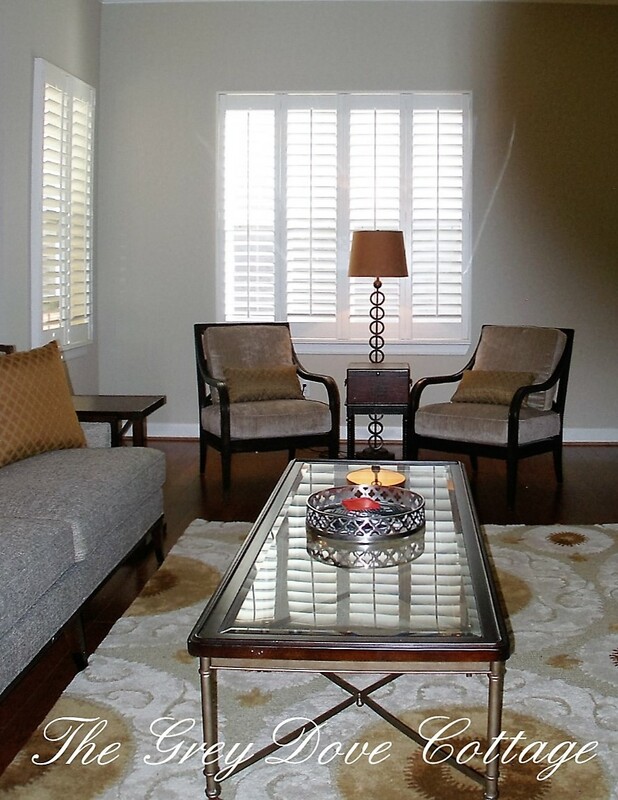 In consideration of travel costs, the owners of the company chose to purchase a condo in "Midtown", Houston. Midtown is a great location, centrally located, and walking distance to restaurants, and shops. Many people do not understand how incredibly vast Houston is; with a land mass similar to the state of Massachusetts, and similar population, getting around Houston can be a mind boggling experience. It was important to chose a central location, though appointment travel may easily be an hour, one way. We won't discuss traffic. 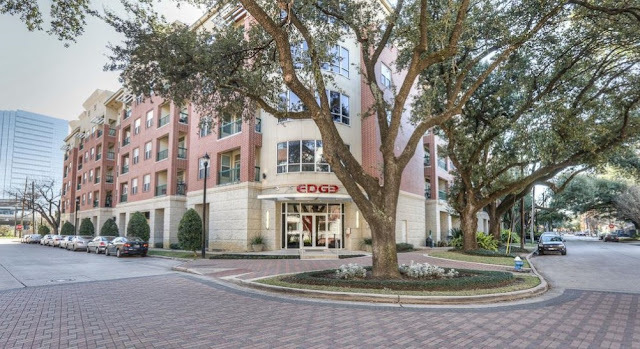 With no office space in Houston, the corporate condo needs to serve as a home away from home, work space, meeting space, and client entertaining space. The owners of the company enlisted my services to assist with furniture, and décor. It was a daunting, yet humbling task. I appreciate the confidence of Mr. GDC's company owners. Approximately 2200 square feet, the condo offers three bedrooms, two and half baths, with a large open living space. The majority of guest frequenting the condo are men. We chose a simplistic and masculine theme. Mrs.Owner wanted to keep accessories, including art to a minimum. The open living dining space needed to be comfortable, yet versatile. I proposed a stainless steel, farm style dining table; the stainless steel would provide an industrial edge, a trestle bottom and length would be perfect for meetings. I paired the table with upholstered chairs, with high backs to provide support and comfort during meetings. Often there would be more than one gentlemen staying at the condo. It was important to meet the needs of multiple guests. I proposed a pair of arm chairs that could be easily relocated throughout the space as additional seating, along with computer tables as end tables. The "C" tables could be moved in front of the sofa, or arm chairs to create a comfy place to work on laptops, or pads. 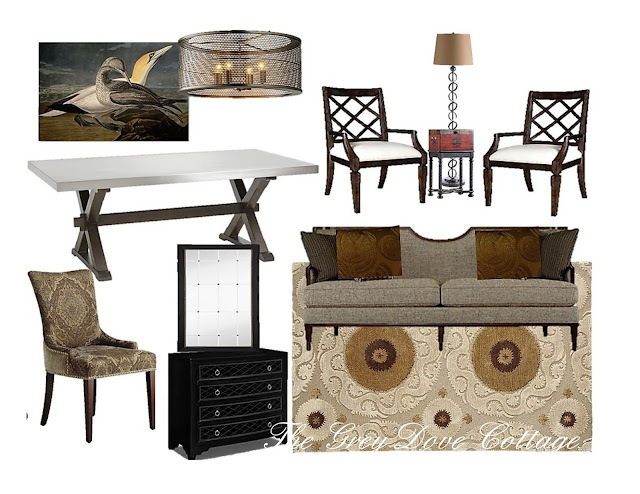 These pieces could easily transition from work to entertaining. Mrs. 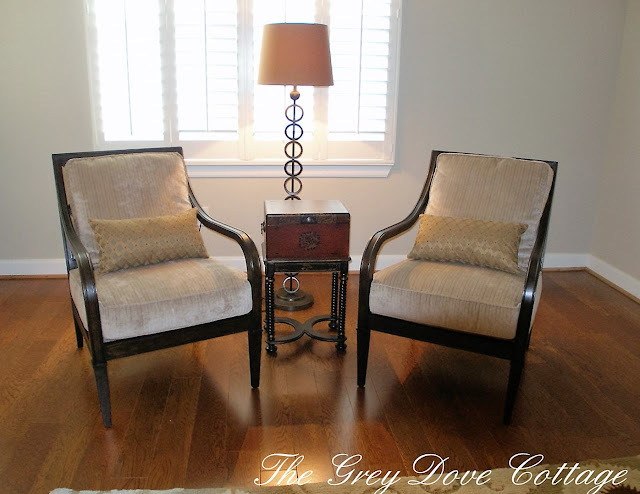 Owner requested a neutral color scheme, with accents of gold. Visiting our home, Mrs. Owner requested Sherwin Williams Accessible Beige, our paint color. 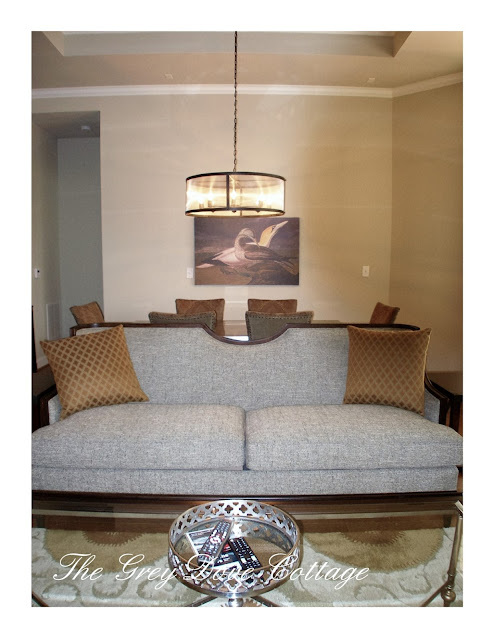 We wrapped the entire condo in AB to serve as the neutral background she desired. We chose a medallion patterned, hi-low area rug to provide color, pattern, and texture. 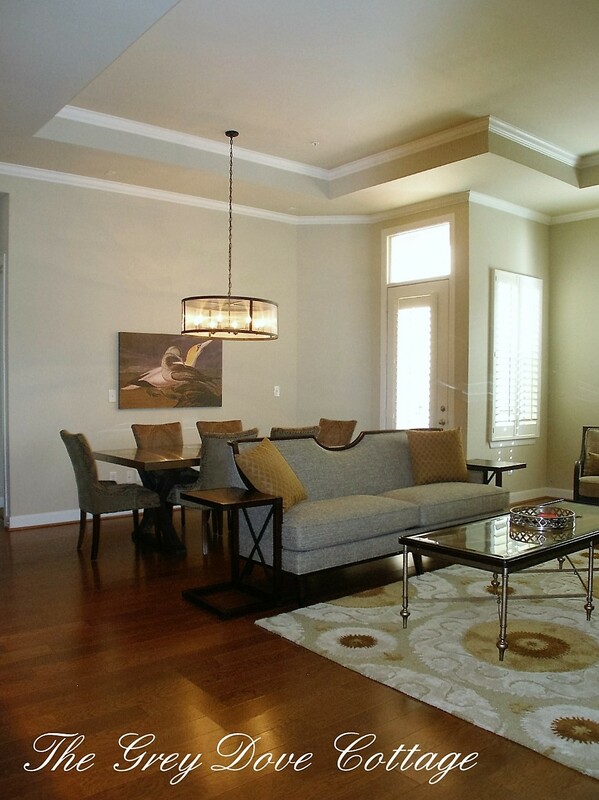 The condo has ten foot tray ceilings that a great deal of interest, and architecture. When using a simplistic design scheme, architecture can truly help to add interest. The public space is a large open room; living, dining, a small bay window, and the kitchen are open to one another. The kitchen needed to be left as is. Our budget didn't include a renovation at this time. We chose a high back sofa for comfort, meetings can be taken there, and the "C" tables, can easily be moved from the end of the sofa to the front, creating a work space. The high back of the sofa helps to define, and separate the dining space from living space, alleviating the need for a sofa table. The dining space serves as dining, meeting, and occasionally buffet dinner for entertaining employees and clients. We chose a table with a stainless steel top, and weathered wood base. The trestle style allows chairs to easily be added, and moved about the table without the obstruction of legs. The stainless steel top gives the space an industrial edge, while also providing a bit of interest through its shiny surface. We chose to accent the stainless top with a mess, drum chandelier, repeating the industrial element. 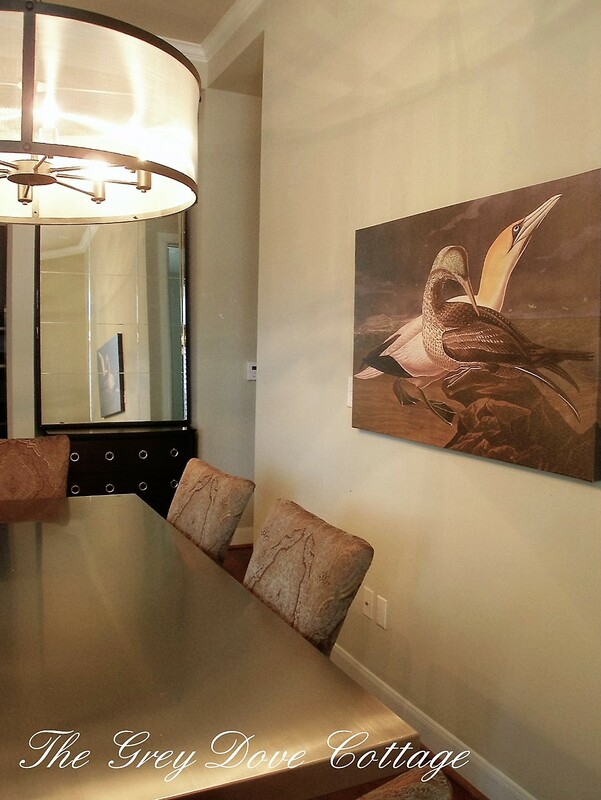 We chose to pair the table with an Audubon print on canvas. The clean lines with no frame help to provide a contemporary edge to the space. 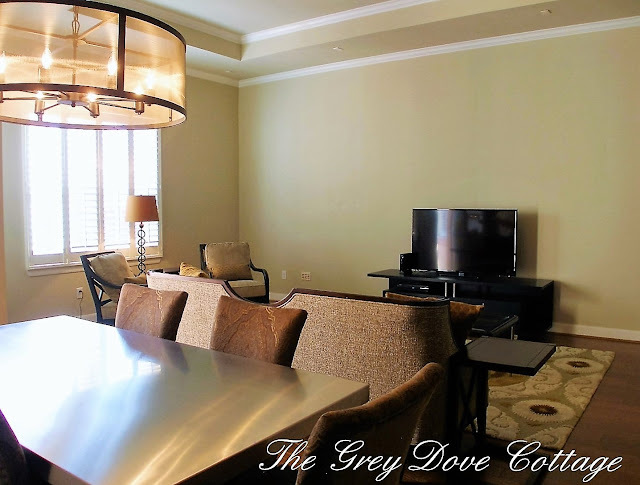 The print was used for our color scheme throughout the condo; blues, grey, topaz, brown, gold with a hint of deep red. 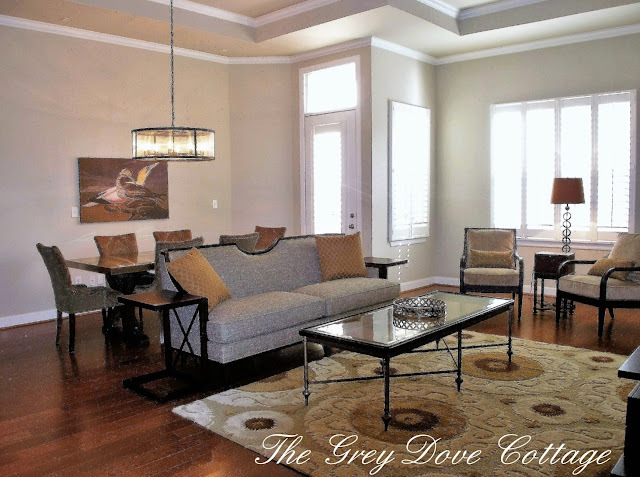 The sofa dressed in a soft taupe tweed fabric, adds texture, and will wear well. We added a nickel coffee table and accessories to carry the shine from the stainless topped dining table into the living space. Custom pillows in a tobacco harlequin pattern pull the color from Audubon canvas, and rug. The high back sofa works well with the ten foot ceilings in the space. A normal height sofa would appear small. Tall "C" tables work well with the high back sofa, again taking up vertical space. The "X" motif in the "C" tables, work with the "X" stretcher under the coffee table, and in the gallery of the tray upon the coffee table, as well as the trestle dining table base. 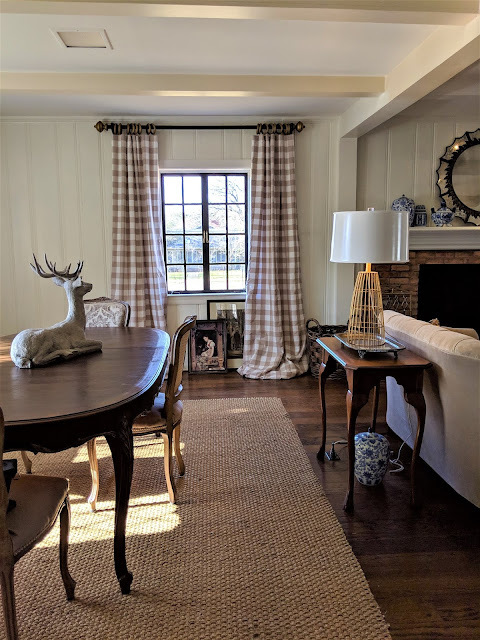 It is important when designing a space to repeat elements in an effort relate one space to another. A niche between the dining space, and the hallway to the master suite, provided the perfect space to tuck a chest. The chest houses office and party supplies within easy access of the table. Again the "X" motif was repeated in the chest, also chosen for it's nickel finished pulls. 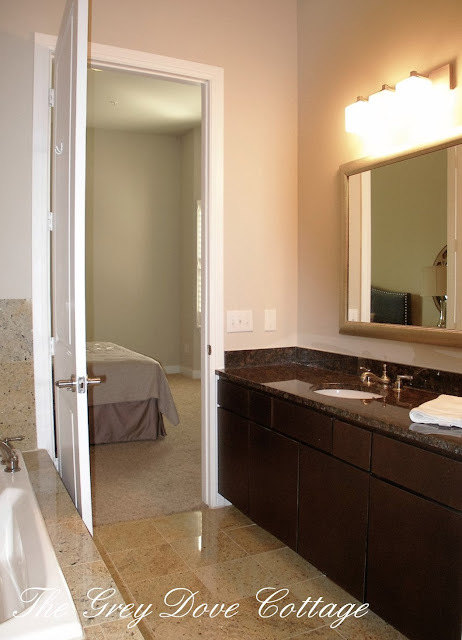 A tall mirror added above the chest fills in the space and provides vertical interest to prevent the chest from appearing short in a space with ten foot ceilings. The master suite is the company owner's refuge when in Houston. 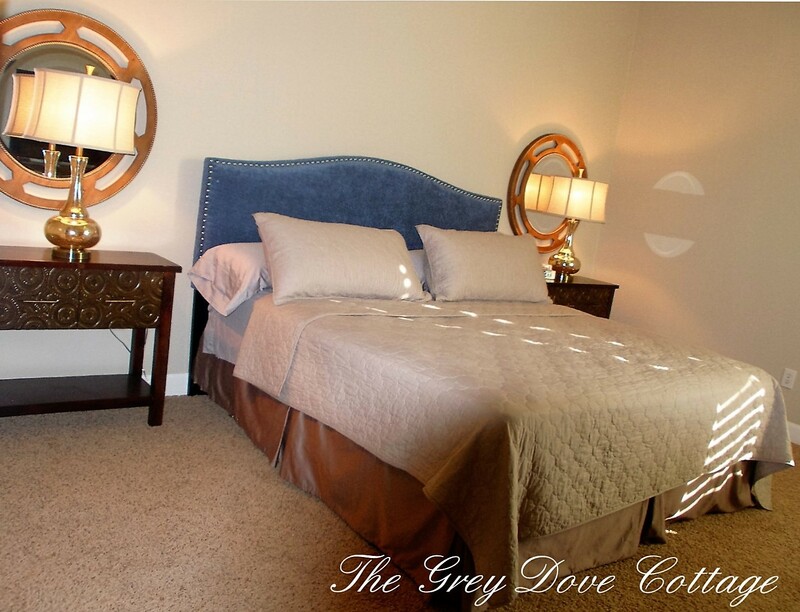 We chose a blue upholstered headboard with nickel nail head trim. Paired small buffet style chest as side tables to provide dresser storage, and bottom shelf where a small suitcase could easily be set. The chest feature carved wooden drawers with a circle motif finished in burnished gold. The circle motif is repeated in the round wooden mirrors behind the mercury glass lamps. The round mirrors feature a small nickel finish row of nail heads around the mirror edge. The master bath was kept simple; white towels, clean counters to allow space for man's toiletry bag to be sat. The condo is built in a mother-in-law plan. The master on one side of the condo; then two bedrooms, a half bath, and a full bath upon the other side. Walking back through the open space form the master suite, the view is of the dining then living areas. Mrs. Owners specifically requested the television be left singularly upon the wall. 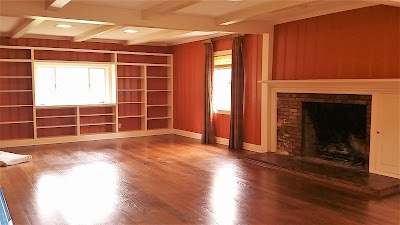 I must admit it was the most difficult request for me to execute, resisting adding artwork, bookcases etc... to the very empty wall. At the end of the bedroom hallway, there is a large niche. 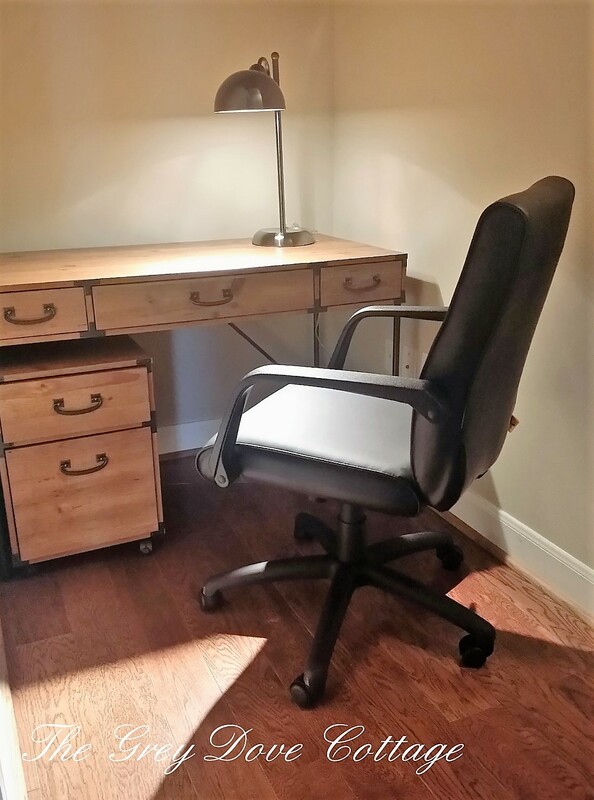 We chose to incorporate a small desk, and office chair to create a quiet, and somewhat private space to work. Along this hallway are the two additional bedrooms. There are instances when multiple guests are houses at the condo. 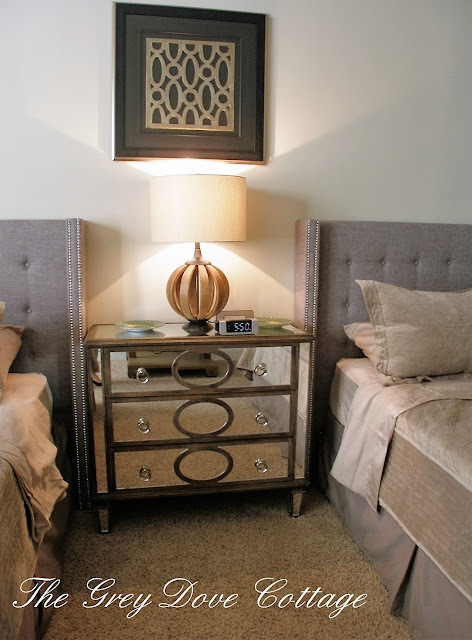 We chose to make one bedroom a multi guest suite; two queen beds, and a chest of drawers serve guest. In keeping with our design plan, we chose a mirrored, weather wood chest of drawers. The pattern is repeated in the artwork above the chest, and again in the toss pillows upon the beds. 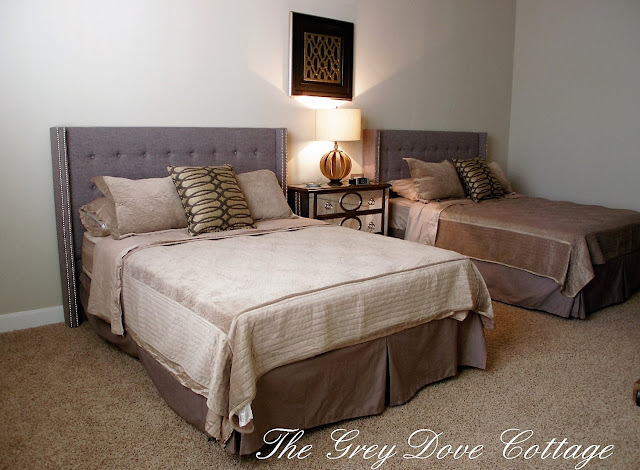 We continued the color scheme here with grey upholstered headboards, and taupe velvet bedding. 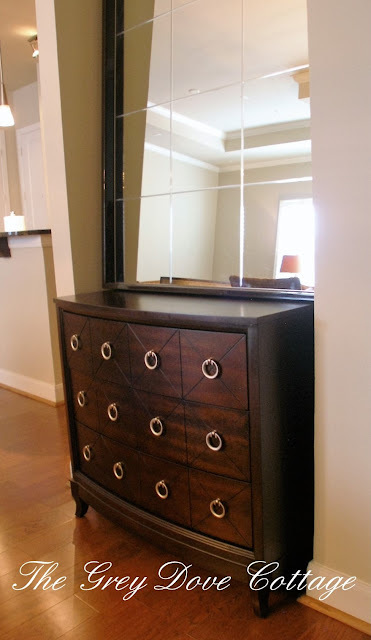 Repeated elements included nickel nail head trim, weathered wood, and the reflective surface of the mirrored chest. The final bedroom we chose again to repeat the upholstered headboard, with nail head trim. This time the nail heads are burnished gold. I paired tall, narrow chest featuring a chevron wood inlay as side tables, with burnished gold pulls. The chest add pattern and height to the space. 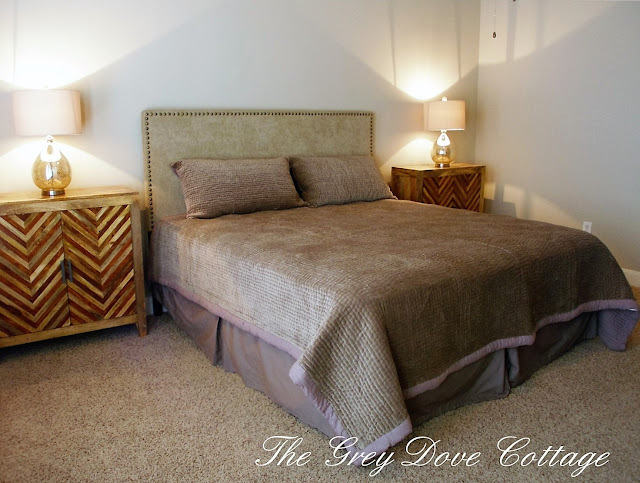 We repeated soft velvet bedding in a dark taupe, keeping the color scheme neutral. 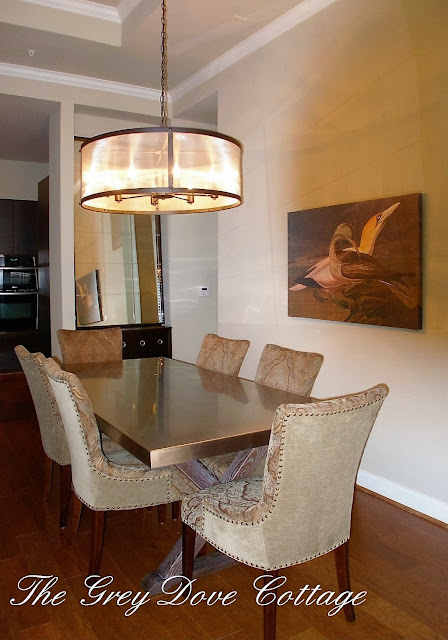 An amber glass lamp with a nickel base was used to tie in the burnished gold, with the nickel finishes used in the remainder of the condo. In the bay area we paired thick cushioned wood frame chairs with a hand painted red chest side table. The table adds a little color, and art to the living space, while remaining versatile to be moved about as needed. 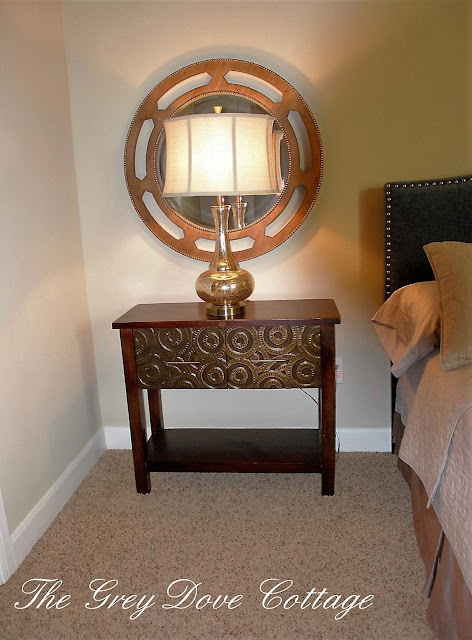 Behind the grouping a floor lamps featuring rustic rings pulls the ring motif from the chest in the niche to this side of the room, the half rings at the chest base pull the design together. The chairs are versatile and easy to move, allowing guest to relocate them as needed for meetings or entertaining. Our neutral design plan paired with repeating elements throughout the condo created an inviting, unpretentious space for guests to feel at home. Utilizing multifunctional furniture pieces is key to the versatility of the living space, allowing transition from living, to work, and entertaining. 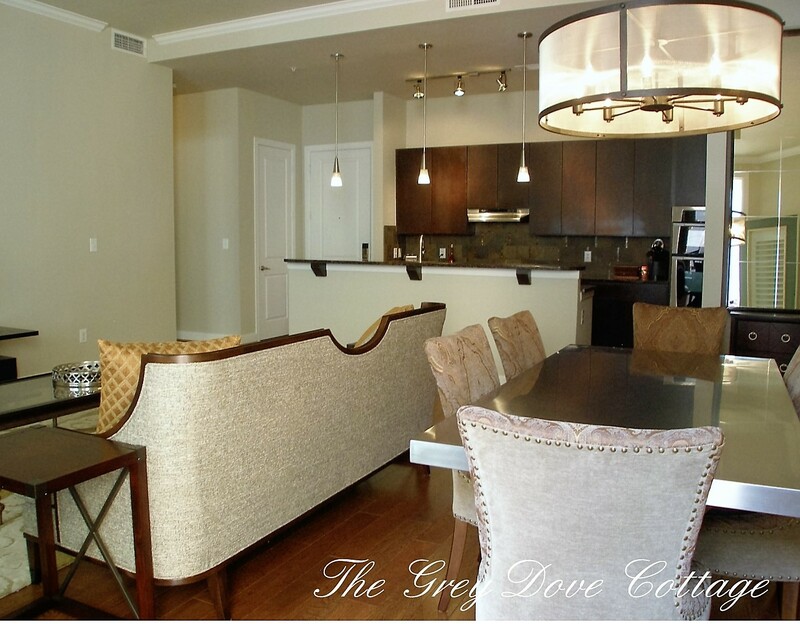 I hope you enjoyed the tour of this Houston condo project. Working with a corporate clients was a new experience for me, one I enjoyed very much.